Crucial to the survival of a glacier is its mass balance, the difference between accumulation and ablation (melting and sublimation). Climate change may cause variations in both temperature and snowfall, causing changes in mass balance. Changes in mass balance control a glacier’s long term behavior. It is the most sensitive climate indicator on a glacier. A glacier with a sustained negative balance is out of equilibrium and will retreat. A glacier with a sustained positive balance is out of equilibrium and will advance. A glacier that cannot retreat to a new point of equilibrium due to negative balances will disappear. Mass balance studies have been carried out in various countries worldwide, but have mostly conducted in the Northern Hemisphere due to there being more mid-latitude glaciers in that hemisphere. The World Glacier Monitoring Service annually compiles the mass balance measurements from around the world. The similarity of response of glaciers in western North America indicates the large scale nature of the driving climate change. Mean annual glacier mass balance in 2016 was −847 mm for the 37 long-term reference glaciers and −761 mm for all 140 monitored glaciers. Of the reporting reference glaciers, only one had a positive mass balance. 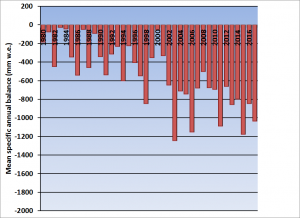 Preliminary data reported to the WGMS in 2017 from Austria, Canada, China, France, Italy, Kazakhstan, Norway, Russia, Switzerland, and United States indicate that 2017 will be the 38th consecutive year of negative annual balances with a mean loss of −1036 mm for 29 reporting reference glaciers (as of this writing), with three glacier reporting a positive mass balance. If this was a company it would be bankrupt (Figure 2). The cumulative mass balance loss from 1980–2016 is −19.9 m, the equivalent of cutting a 22-m thick slice off the top of the average glacier ( The trend is remarkably consistent from region to region (WGMS 2017). 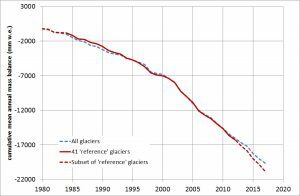 WGMS mass balance based on 41 reference glaciers with a minimum of 30 years of record is not appreciably different from that of all glaciers at −19.1 m. The decadal mean annual mass balance was −228 mm in the 1980s, −443 mm in the 1990s, −676 mm for 2000s, and –896 mm for 2010–17 (WGMS 2017). The Lemon Creek and Taku Glacier near Juneau, Alaska has been studied by the Juneau Icefield Research Program since 1946, and they are the longest continuous mass balance study of any glacier in North America. 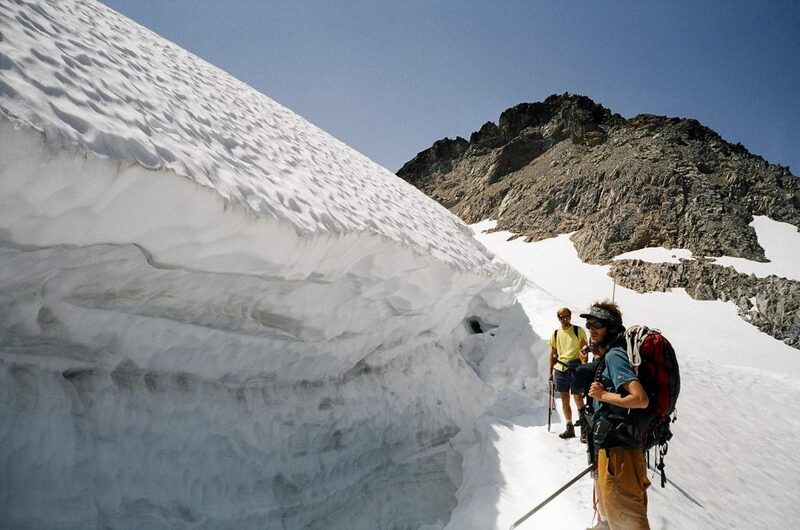 Lemon Creek Glacier has lost 25 meters in mean thickness since 1953, between 20-30% of its entire volume. Taku is the world’s thickest known temperate alpine glacier, and experienced positive mass balance between the years 1946 and 1988, resulting in a huge advance. The glacier has since been in a negative mass balance state, which may result in a retreat if the current trends continue. The mass balance of Hintereisferner and Kesselwandferner glaciers in Austria have been continuously monitored since 1952 and 1965 respectively. Having been continuously measured for 55 years, Hintereisferner has one of the longest periods of continuous study of any glacier in the world, based on measured data and a consistent method of evaluation. Currently this measurement network comprises about 10 snow pits and about 50 ablation stakes distributed across the glacier. In terms of the cumulative specific balances, Hintereisferner experienced a net loss of mass between 1952 and 1964, followed by a period of recovery till 1968. Hintereisferner reached an intermittent minimum in 1976, briefly recovered in 1977 and 1978 and has continuously lost mass in the 30 years since then. Glacier mass balance studies have been ongoing in New Zealand glaciers since 1957. Tasman Glacier has been studied since then by the New Zealand Geological Survey and later by the Ministry of Works, measuring the ice stratigraphy and overall movement. However, even earlier fluctuation patterns were documented on Franz Josef and Fox Glaciers in 1950. Other glaciers on the South Island studied include Ivory Glacier since 1968, while on the North Island, glacier retreat and mass balance research has been conducted on the glaciers on Mount Ruapehu since 1955. On Mount Ruapehu, permanent photographic stations allow repeat photography to be used to provide photographic evidence of changes to the glaciers on the mountain over time. The North Cascade Glacier Climate Project measures the annual balance of 9 glaciers, more than any other program in North America. These records extend from 1984–2005 and represent the only set of records documenting the mass balance changes of an entire glacier clad range. To monitor an entire glaciated mountain range in North America, which was listed as a high priority of the National Academy of Sciences in 1983. 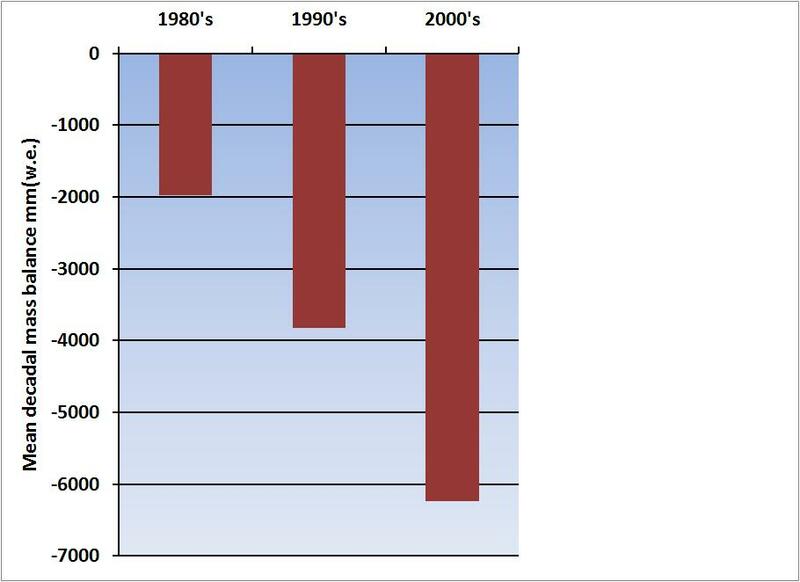 North Cascade glaciers annual balance has averaged −0.52 m/a from 1984–2005, a cumulative loss of over 12.5 m or 20–40% of their total volume since 1984 due to negative mass balances. The trend in mass balance is becoming more negative which is fueling more glacier retreat and thinning. Norway maintains the most extensive mass balance program in the world and is largely funded by the hydropower industry. Mass balance measurements are currently performed on twelve glaciers in Norway. In southern Norway six of the glaciers have been measured for 42 consecutive years or more, and they constitute a west-east profile reaching from the very maritime Ålfotbreen Glacier, close to the western coast, to the very continental Gråsubreen Glacier, in the eastern part of Jotunheimen. Storbreen Glacier in Jotunheimen has been measured for a longer period of time than any other glacier in Norway, a total of over 55 years, while Engabreen Glacier has the longest series (35 years) in northern Norway. The Norwegian program is where the traditional methods of mass balance measurement were largely derived. The Tarfala Research Station in the Kebnekaise region of northern Sweden is operated by Stockholm University. It was here that the first mass balance program was initiated immediately after World War II, and continues to the present day. This survey was the initiation of the mass balance record of Storglaciären Glacier, and constitutes the longest continuous study of this type in the world. Temporal changes in the spatial distribution of the mass balance result primarily from changes in accumulation and melt along the surface. As a consequence, variations in the mass of glaciers reflect changes in climate and the energy fluxes at the earth’s surface. The Swiss glaciers Gries in the central Alps and Silvretta in the eastern Alps, have been measured for many years. The distribution of seasonal accumulation and ablation rates are measured in-situ. Traditional field methods are combined with remote sensing techniques to track changes in mass, geometry and the flow behaviour of the two glaciers. These investigations contribute to the Swiss Glacier Monitoring Network and the International network of the World Glacier Monitoring Service (WGMS). The USGS operates a long-term “benchmark” glacier monitoring program which is used to examine climate change, glacier mass balance, and stream runoff. This program has been ongoing since 1965 and has been examining three glaciers in particular. Gulkana Glacier in the Alaska Range and Wolverine Glacier in the Coast Ranges of Alaska have both been monitored since 1965, while the South Cascade Glacier in Washington State has been continuously monitored since the International Geophysical Year of 1957. This program monitors one glacier in each of these mountain ranges, collecting detailed data to understand glacier hydrology and glacier climate interactions. CGS is in charge of monitoring the western Canada mass balance network Helm, Place and Peyto Glacier. The Arctic glaciers Baby, Devon and White Glacier. CGS relies on standard stake methods for monitoring the glaciers. Helm Glacier (-33 m) and Place Glacier (-27m) have lost more than 20% of their entire volume, since 1980, Peyto Glacier (-20 m) is close to this amount. The Canadian Arctic White Glacier has not been as negative at (-6 m)since 1980. The glacier monitoring network in Bolivia a branch of the glacio-hydrological system of observation installed throughout the tropical Andes by IRD and partners since 1991 has monitored mass balance on Zongo (6000 m asl), Chacaltaya (5400 m asl) and Charquini glaciers (5380 m asl). In 2009 the Chacaltaya Glacier disappeared.. A system of stakes has been used, with frequent field observations, as often as monthly. These measurements have been made in concert with energy balance to identify the cause of the rapid retreat and mass balance loss of these tropical glaciers. Figure 3: The cumulative global glacier mass balance record of glaciers reporting to WGMS. The increasingly negative trend is evident.